It’s a beautiful Sunday morning and the sun has just shown it’s beautiful face here in the harbor. It’s days like this that make me think of my home back in Texas. By now, my brothers and my pop are just gettin’ back from church service. I’m here in my little piece of heaven. Don’t get me wrong, or nothing, I’m not home sick. I’ve enjoyed nearly every day in the Navy, except for PT. I’ve met some interesting fellows aboard this here ship. I hope that I’ll see some interesting places before my service is up. I haven’t decided yet if I’ll make the Navy a career. Right now I’m just a Seaman First Class, but I’d like to move up the ladder to a Petty Officer. The duty is light today, it being Sunday and all. There are no drills scheduled today. Scuttlebutt says that we may be put on high alert, ‘cause of them Japs. I’m off until mid-watch. I can’t sleep so, I’m deck looking over the harbor. I love this time of the day, ‘cause it’s quiet and the water’s calm. I’m off to the head, then I’m gonna try and get more sleep before my shift tonight. It looks like it’s gonna be another quiet night. Gull darn it! The ship’s air raid alarm just went off! I knew it was to good to be true! Holy smokes! Where did that plane come from? They’re bombing us! That plane is a Jap... Come on boys let’s get ‘em..
My name is Samuel Adolphus Abercrombie and I was a Seaman First Class on the USS Arizona during the attacks on Pearl Harbor. December 7, 1941, was my last day alive. The crew and I fought with everything we had. But, it was the explosion near the ammunition magazines in the forward section of the ship that caused her - the Arizona - to sink. With her, 1,177 souls sank to the bloody bottom. We are now lost to Davy Jone’s locker. It was 07:55 when the air raid went off and the last bomb hit her hull at 08:06. Just a little over ten minutes and we were sinking, doomed forever to a life at sea. Time is of no consequence down here. We are just replaying the events of that fateful morning over and over again. We are just mere spirits stuck in time. December 7, 1941 - a date which will live in infamy... President Franklin D. Roosevelt. It’s considered a lifetime, seventy-four years. For many of us, we grew up learning about the events that took place on that crucial day. For some it was through history class, books and even movies. For others, it was first hand by our mothers, fathers, and Grandparents. The attack on Pearl Harbor lasted less than two hours and claimed the lives of more than 2,500 people and wounded 1,000 more. Almost half of the casualties during the attacks were on the navel battleship USS Arizona, including Samuel Adolphus Abercrombie. Mr. Abercrombie was the fifth child of John and Maud Abercrombie. He was born in Leggett, Texas, on May 18, 1919, three years after the Arizona was commissioned. Samuel never knew his mother, as she died giving birth to him. This song is a haunting reminder of one of the lost souls of the USS Arizona. “That song really means a lot to me ‘cause that guy is a real guy!” shares Ronnie Bowman of the Band of Ruhks. “We found out as much as we could find out on the internet, me and my co-writer Kim Fox. She came over here that day...I had this line and a melody that went ‘I was a sailor on a ship named...’ I knew that the guy’s name was Samuel Adolphus Abercrombie. So, she being very computer literate, more so than I am. She got on there and found out all this information. It was WOW! He was born in Leggett, Texas. There was five of ‘em. His mother had died. So, we started puttin’ two and two together. We wanted to make it a song that just didn’t sing about Pearl Harbor. 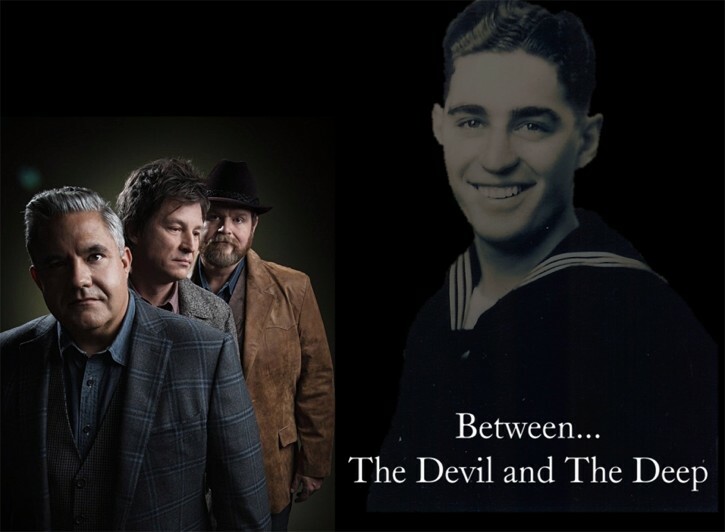 “Between The Devil And The Deep” is a song larger than life. More so, the song is one of three taken from the Band of Ruhks’ self entitled debut album to hit our list of Top Songs of 2015, while earning a nomination for the Spirit Award’s Song of The Year Award. Pronounced rook as in piece taken from the game of chess, the Band of Ruhks are no strangers to the Bluegrass family. The trio is a combination of three very talented men including Ronnie Bowman, Don Rigsby and Kenny Smith. The word ‘ruhk’ is considered a chess piece, a large black bird and a card game. Which makes me ask which of the band members represent which of the meanings of the word? The trio were once part of the bluegrass band the Lonesome River Band. Over the years, each of them left for different reasons. It was at a reunion performance, in 2010, that the boys came together once more. 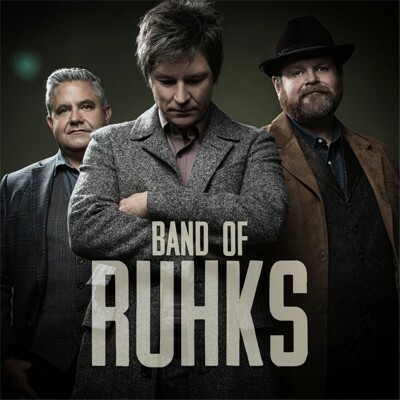 After several other performances together, the trio chose to officially form a band called the Band of Ruhks. On March 17th, the boys released their self-entitled debut album on 101 Ranch Records. The album features a fresh new take on Bluegrass within it’s thirteen cuts, five of which are co-wrote by Bowman. What’s so refreshing with this trio is their unique understanding of the lifeblood, heart and soul of country and bluegrass music. The infusion of the two genres is awesome to the point of pure enjoyment. It’s an ecstasy of musical euphoria! The album opens with “All The Way” performed in a classic late 1980’s country music melody with Bluegrass instrumentals. A Bluegrass album is not a Bluegrass album without a song about bootlegging. The Ruhks include just a song in “Bootleg John.” Performed in your classic Bill Monroe Bluegrass style, this is one that captures the astounding tight harmonies that this trio maintains. The boys slow it down just a bit with a very simplistic song of love in “Run With It.” Performed in a light hearted two-step, this song contains a beautiful uncluttered, rustic and natural feel to falling in love. If I were to choose a theme song for myself, this one would be it. On the flip side, the boys pick up the pace in “Can’t Get Over You.” Performed in a vintage country feel, this one is sure to get your feet stomping as it delivers a message about dealing with breaking up. The second song that I pulled from this album to hit our list of Top Songs of 2015 is “Good Time Mountain Man.” It has been a long time since I have heard a song that is worthy of a live performance at the Grand Ole Opry. With a simple message that is performed in a classic Roy Acuff feel, this is that song! The album continues with “Lost Highway,” “Happy All The Time” and “Here Comes A Broken Heart.” The boys also gain the help from Dr. Ralph Stanley in “Coal Mining Man.” However, it’s “Rendezvous With Danger” that hits us hard. Hitting our list of Top Songs of 2015, “Rendezvous With Danger” is a very compelling and influential song that only comes around once in a while. It is performed with an up beat melody that contains a mournful story that ends with a curve ball. The theme of this song is about two people on two different paths in life; one who is trying to get home and the second who chooses to drive while intoxicated. You may think you know the out come, nonetheless, there is a little surprise at the end of the song. Harley Allen was a genius when he penned this song. Most songs, such as this, the listener can predict the outcome prior to the ending of the song. Despite the story in this song, you as the listener chooses how the story ends. Thus creating a mixture of interpretations within a single song. It is quite uncommon for an album to come along that is completely perfect in every way. The Band of Ruhks feed on their combined talents and emerge with an album that permeates the gallantry, fearlessness, graciousness, honor, spirit, compassion, goodwill, togetherness, honest and trustworthy experience that country music was founded on. The only trait that is missing is theology. And even then, one can find the band’s beliefs hidden deep within the soul of several of these songs. It’s because of the spirit within this album that I am honored to nominate this album for the Spirit Award’s Album of The Year Award. It is rare that I get so enthusiastic about an album. In fact I can count on one hand the albums that are completely worth their monetary value. However, I must say this truly is the one album that should bestow the title of Album of The Year.